Middle Eastern Cuisine is already predicted to be the next big thing. It is such a talk of the town, especially when many Western mass media talks about rising of that exotic cuisine. One of the most popular kinds of the Middle Eastern cuisine is Moroccan food. Their hearty dishes are adored by many culinary lovers. Here in Indonesia, there are already many successful Middle Eastern restaurants. However, Moroccan food is indeed an interesting fresh concept and predicted to be the new star. It could be a good idea for those who attempt to start an ethnic restaurant business. What is the essential of Moroccan cuisine? Moroccan cuisine is famous for its spices, exotic ingredients, and unique cooking technique. They are influenced by Arabic, Berber, Andalusian, and Mediterranean cuisine. This food is developed by royal cooks in many Moroccan regions, thus it explains the rich flavour in every dishes. A typical meal in Moroccan restaurant starts with cold or hot salad as an appetizer followed by a main course which can be a tagine or a meat dish served with couscous. To wash down all of them, a waiter will serve a cup of mint tea. Moroccan cuisine bases on Mediterranean crops and their selection of meat. They include mutton, lamb, beef, chicken, and even camel. Moroccan people also like to use home-grown spices and herbs that enrich their food. Some particular ingredients like lemon pickles and dried fruits also give Moroccan cuisine their distinctive flavour. The most famous spice mix of Morocco is undoubtedly ras el hanout. It means “head of the shop” or “top shelf”. It implies that this spice mix is the one that should be on top shelf and becomes the main choice of spice mix in every kitchen. There is no exact recipe although some purists insist that it must consist of twelve spices. The most popular spices to include in ras el hanout are cumin, cinnamon, fenugreek, cardamom, turmeric, nutmeg, peppercorn, chili peppers, paprika, and clove. However, the true icon of Moroccan cuisine is a delicious pot of tagine. The name of this dish comes from a clay pot, often painted with bright colour, with a lid used for cooking and serving this dish. The base is a round bowl while the top is cone-shaped in order to catch all the condensation and return it to the bowl. Although we do not add water when cooking, the dish will still be moist, tender, and rich. The dish cooked in this pot consists of spiced meat or chicken and vegetables If you want to open a Moroccan restaurant, this cooking ware is a must have. Whether you choose to open a Moroccan restaurant, or simply add Moroccan-influenced food on your menu, the charm of Moroccan cuisine is hard to resist. This most spicy Mediterranean menu is less spiced than Indian cuisine, but it still warms your soul. 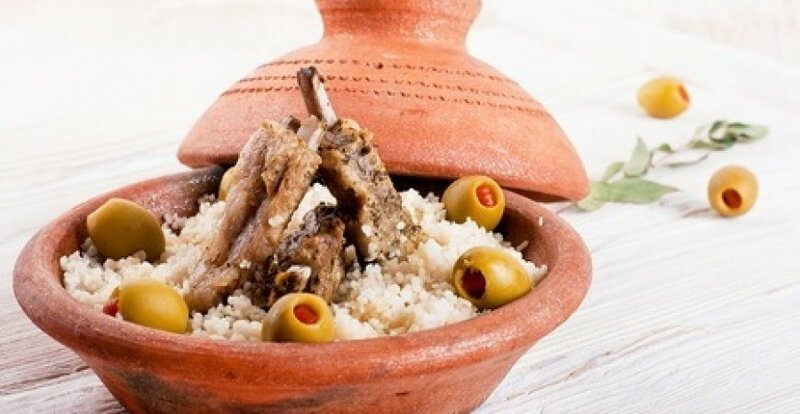 Serving well-cooked Moroccan lamb in a bed of couscous or hearty tagine in your restaurant will bring happiness for your customer.